Super Eagles vice captain, Ahmed Musa and striker Henry Onyekuru have spoken of their excitement at Nigeria returning to the Africa Cup of Nations and are hopeful of a good outing in Cameroon 2019. 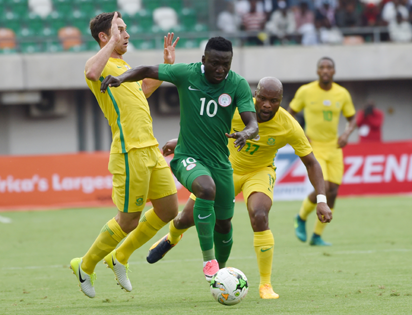 The Super Eagles were forced to a 1-1 draw by South Africa last Saturday in Johannesburg, but the result was still good enough to earn the team a qualification, after missing the 2015 and 2017 editions. “We needed the point in Johannesburg to qualify with a game in hand after we had lost out on two tournaments,” Musa said. “We are happy we are back to a tournament Nigeria are very familiar with. “It was a thing of joy to qualify with a game in hand, the way we did when we qualified for the 2018 World Cup. Onyekuru took to twitter to express his feeling. “We are back! Huge congratulations to the team for the performance.